When I think New Year's Eve, I think silver and sparkles! I haven't been to a fancy New Year's Eve party in ages, but it's fun to plan the perfect outfit just in case I snag a great invite. (Reality? I'll be at home with some bubbly and the cat. But let's dream, shall we?) I decided that a navy dress with silver accessories would be perfect to ring in 2012! I also love dark tights to keep you warm in the winter, so you can still wear a pretty dress. 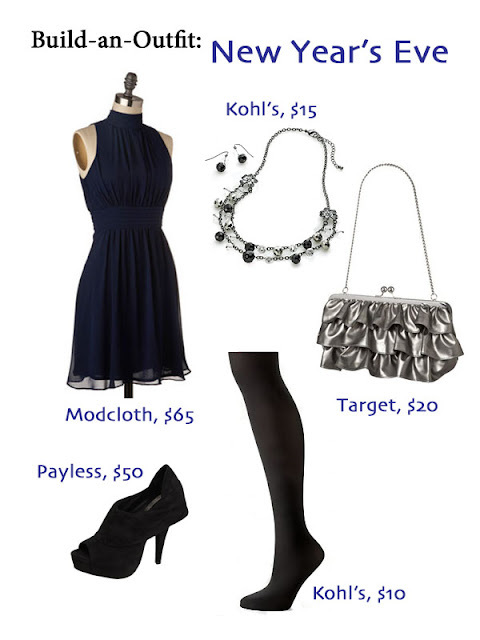 Here's what I would wear, for $160!